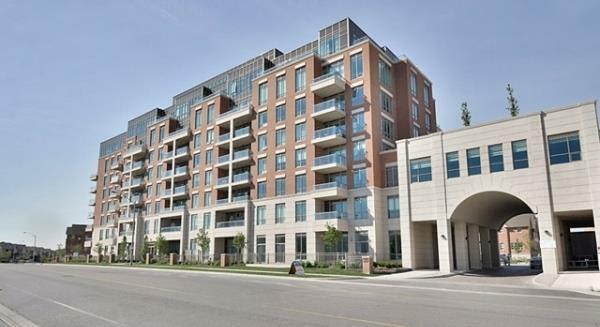 The Emporium condominium at Joshua Creek is located at Prince Michael Drive in Oakville. The condominium suites within Emporium are accommodated in an L-shaped residence rising 8 storeys high, with an attractive brick and pre-cast stone façade. A wide range of one and two bedroom designs are available to choose from, many with dens and all with private balconies. The lobby evokes the ambiance of a boutique hotel, with a striking two-sided black marble fireplace as its focal point, contemporary furnishings, all under the watchful eye of a 24-hour concierge. Built by Ashley Oaks, Emporium offers a number of one, one plus den. two and two bedroom plus den open concept floor plans providing between 530 and 1,562 square feet. The Emporium Club offers residents an array of fitness, social and leisure time amenities from which to choose. Enjoy an evening swim in the heated pool, a soak in the elevated whirlpool, or the afternoon sun on the patio lounge outside. Work out in the Fitness & Aerobics Studio with its state-of-the-art cardio, stretching and weight training equipment. Screen the latest DVD or watch the big game in the Media Room with its big screen TV, surround sound and tiered cinema seating. Gather with friends in the 3rd-floor Party Room with its two-sided fireplace, kitchen and bar... host a dinner party in the private Dining Room... or gather for a hand of cards or a round of billiards in the Games Room. In addition, a fully furnished Guest Suite is available for the comfort and convenience of your overnight visitors.